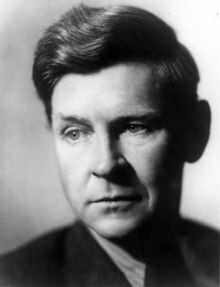 William Olaf Stapledon (10 May 1886 – 6 September 1950) – known as Olaf Stapledon – was a British philosopher and author of science fiction. In 2014, he was inducted into the Science Fiction and Fantasy Hall of Fame. Stapledon was born in Seacombe, Wallasey, on the Wirral Peninsula in Cheshire, the only son of William Clibbett Stapledon and Emmeline Miller. The first six years of his life were spent with his parents at Port Said, Egypt. He was educated at Abbotsholme School and Balliol College, Oxford, where he acquired a BA degree in Modern History (Second Class) in 1909, promoted to an MA degree in 1913. After a brief stint as a teacher at Manchester Grammar School he worked in shipping offices in Liverpool and Port Said from 1910 to 1912. From 1912 to 1915 Stapledon worked with the Liverpool branch of the Workers' Educational Association. During the First World War he served as a conscientious objector. Stapledon became an ambulance driver with the Friends' Ambulance Unit in France and Belgium from July 1915 to January 1919; he was awarded the Croix de Guerre for bravery. On 16 July 1919 he married Agnes Zena Miller (1894–1984), an Australian cousin. They had first met in 1903, and later maintained a correspondence throughout the war. They had a daughter, Mary Sydney Stapledon (1920–2008), and a son, John David Stapledon (1923–2014). In 1920 they moved to West Kirby. Stapledon was awarded a PhD degree in philosophy from the University of Liverpool in 1925 and used his doctoral thesis as the basis for his first published prose book, A Modern Theory of Ethics (1929). However, he soon turned to fiction in the hope of presenting his ideas to a wider public. The relative success of Last and First Men (1930) prompted him to become a full-time writer. He wrote a sequel, Last Men in London, and followed it up with many more books of both fiction and philosophy. For the duration of the Second World War Stapledon abandoned his pacifism and supported the war effort. In 1940 the Stapledon family built and moved into a new house on Simon's Field, in Caldy, in Wirral. During the war Stapledon become a public advocate of J.B. Priestley and Richard Acland's left-wing Common Wealth Party, as well as the British internationalist group Federal Union. After 1945 Stapledon travelled widely on lecture tours, visiting the Netherlands, Sweden and France, and in 1948 he spoke at the World Congress of Intellectuals for Peace in Wrocław, Poland. He attended the Conference for World Peace held in New York City in 1949, the only Briton to be granted a visa to do so. In 1950 he became involved with the anti-apartheid movement. After a week of lectures in Paris, he cancelled a projected trip to Yugoslavia and returned to his home in Caldy, where he died very suddenly of a heart attack. Stapledon was cremated at Landican Crematorium. His widow and their children scattered his ashes on the sandy cliffs overlooking the Dee Estuary, a favourite spot of his that features in more than one of his books. Stapledon Wood, on the south-east side of Caldy Hill, is named after him. Stapledon's fiction often presents the strivings of some intelligence that is beaten down by an indifferent universe and its inhabitants who, through no fault of their own, fail to comprehend its lofty yearnings. It is filled with protagonists who are tormented by the conflict between their "higher" and "lower" impulses. Stapledon's writings directly influenced Arthur C. Clarke, Brian Aldiss, Stanisław Lem, Bertrand Russell, John Gloag, Naomi Mitchison, C. S. Lewis, Vernor Vinge, John Maynard Smith and indirectly influenced many others, contributing many ideas to the world of science fiction. The "supermind" composed of many individual consciousnesses forms a recurring theme in his work. Star Maker contains the first known description of what are now called Dyson spheres. Freeman Dyson credits the novel with giving him the idea, even stating in an interview that "Stapledon sphere" would be a more appropriate name. Last and First Men features early descriptions of genetic engineering and terraforming. Sirius describes a dog whose intelligence is increased to the level of a human being's. Some commentators have called Stapledon a Marxist, although Stapledon distanced himself from the label. Stapledon's work also refers to then-contemporary intellectual fashions (e.g. the belief in extrasensory perception). Last and First Men, a "future history" of 18 successive species of humanity, and Star Maker, an outline history of the Universe, were highly acclaimed by figures as diverse as Jorge Luis Borges, J. B. Priestley, Bertrand Russell, Algernon Blackwood, Hugh Walpole, Arnold Bennett, Virginia Woolf (Stapledon maintained a correspondence with Woolf) and Winston Churchill. In contrast, Stapledon's philosophy repelled C. S. Lewis, whose Cosmic Trilogy was written partly in response to what Lewis saw as amorality, although Lewis admired Stapledon's inventiveness and described him as "a corking good writer". In fact Stapledon was an agnostic who was hostile to religious institutions, but not to religious yearnings, a fact that set him at odds with H. G. Wells in their correspondence. None of Stapledon's novels or short stories has been adapted for film or television, although George Pal bought the rights to Odd John. Castle of Frankenstein magazine reported in 1966 that David McCallum would play the title role. Together with his philosophy lectureship at the University of Liverpool, which now houses the Olaf Stapledon archive, Stapledon lectured in English literature, industrial history and psychology. He wrote many non-fiction books on political and ethical subjects, in which he advocated the growth of "spiritual values", which he defined as those values expressive of a yearning for greater awareness of the self in a larger context ("personality-in-community"). Stapledon himself named his spiritual values as intelligence, love and creative action. His philosophy was strongly influenced by Spinoza. ^ a b c d e f John Kinnaird, "Stapledon,(William) Olaf" in Curtis C. Smith, Twentieth-Century Science-Fiction Writers. Chicago, St. James, 1986. ISBN 0912289279 (pp. 693–6). ^ a b c d e Vincent Geoghegan,"Olaf Stapledon:Religious but not a Christian" in Socialism and religion : roads to common wealth.London: Routledge, 2011. ISBN 9780415668286 (pp. 85–108). ^ "Cheshire Now – Caldy Hill". Retrieved 16 January 2013. ^ Mark Brake (2012). Alien Life Imagined: Communicating the Science and Culture of Astrobiology. Cambridge University Press. p. 225. ISBN 9781139851091. Stapledon's writings greatly influenced not only key players in our own story on pluralism, such as Arthur C. Clarke and Stanislaw Lem, but also figures as diverse as Jorge Luis Borges, Bertrand Russell, Tom Wintringham, Virginia Woolf, and Winston Churchill. ^ Ruddick, Nicholas, "Science Fiction", in Brian W. Shaffer, John Clement Ball, Patrick O'Donnell, David W. Madden and Justus Nieland, The Encyclopedia of Twentieth-Century Fiction. John Wiley & Sons, 2010 ISBN 1405192445,(p. 333). ^ Leibovitz, Liel (1 November 2011). "Star Men". Tablet. Retrieved 1 March 2016. Also, C.S. Lewis cites Olaf Stapledon as an inspiration in his preface to That Hideous Strength. ^ Menon, Anil. "Article: Interview: Vernor Vinge". Strangehorizons.com. Archived from the original on 3 December 2013. Retrieved 24 November 2013. ^ Dvorsky, George (24 April 2004). "John Maynard Smith and Olaf Stapledon". Retrieved 1 March 2016. ^ "MeaningofLife.tv". MeaningofLife.tv. Archived from the original on 9 January 2014. Retrieved 24 November 2013. ^ "I am not a Marxist, but I have learned much from Marxists, and I am not anti-Marxist... Marxism and Christianity spring from the same emotional experience, but each in its way misinterprets, falsifies." quoted in Geoghegan, Vincent, Socialism and Religion: Roads to Common Wealth. ^ Blackwood, Algernon. "Cosmic Thrillers",(Review of Last and First Men, Time and Tide, 20 December 1930. Reprinted in Fantasy Commentator magazine, 6(2):134–136. Fall 1988. ^ Benford,Gregory, "Foreword" in Last and First Men. London, Millennium, 1999. ISBN 1-85798-806-X pp. ix–xi. ^ Amy Mandelker, Elizabeth Powers. Pilgrim Souls: A Collection of Spiritual Autobiography. Simon and Schuster. p. 521. ISBN 9780684843117. ^ Robert Crossley (1994). Olaf Stapledon: Speaking for the Future. Syracuse University Press. p. 388. ISBN 9780815602811. In a lecture to the New Renascence School in London, he reiterated the central paradox of his own spiritual life: "Agnosticism, far from destroying religion, is the gateway to live religion." ...In a 1949 anthology on religion, Olaf gave simple, precise expression to a problem he had wrestled with all his life: the emotional inadequacy of atheism and the intellectual unacceptability of theism. Spirit, for him, meant a character of aspiration, not a substance attributed to souls or deities. ^ "Article: "The Man from M.O.N.S.T.E.R." Castle of Frankenstein, volume 2, No. 4 (1966)". David McCallum Fans Online. Retrieved 25 January 2008. ^ Olaf Stapledon. "The Great Certainty". Retrieved 5 May 2016. ^ Liel Leibovitz. "Star Men". Retrieved 4 September 2018.